Magnesium is essential for blood sugar regulation and feeds hundreds of biochemical reactions in the body. 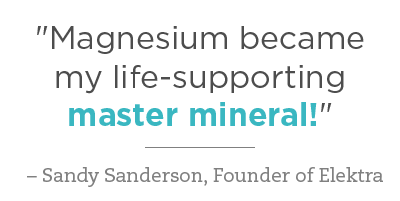 As a result, our magnesium levels are being depleted constantly throughout the day and night. Most of our magnesium comes from our diet, from foods such as green leafy vegetables and nuts. To enhance this supply it is highly beneficial, and even essential, to replenish magnesium from other sources. Magnesium tablets and powders are quickly broken down when taken orally. With only a dilute amount of magnesium reaching through the gut wall. As a result, a huge portion of the population are deficient in magnesium - suffering from tiredness, migraines, mood swings and cravings. Magnesium deficiency can even result in dangerous irregular heartbeats, high blood pressure and muscle spasms. To ensure your body receives enough magnesium, applying magnesium creams directly to the skin, and soaking and bathing the skin in magnesium is necessary. The skin acts as a nutritional reservoir of electrolytes, moisture and fats. Absorbing and holding 99% of the body's magnesium as a reserve and supplying to the body as needed throughout the day. 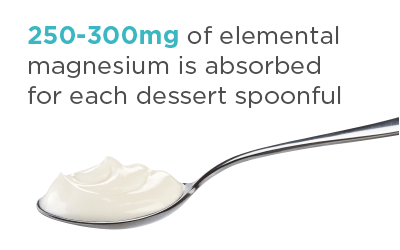 In Elektra Magnesium Cream, 250-300mg of elemental magnesium is absorbed for each dessert spoonful used, equivalent to the average daily recommended magnesium requirement. With daily use, you will experience the benefits of magnesium and have more rested sleep. Magnesium creams are also popular in relieving the symptoms of menopause. If the health benefits of Elektra Magnesium Cream have not convinced you already. Elektra Magnesium is an excellent protection and regenerative anti-ageing skin care product. Helping you maintain a young and healthy appearance. How Much Magnesium Cream Should I Use? The skin self-regulates how much magnesium it supplies into the body, therefore there is no fear of overdosing on the mineral. Be generous with your use of Elektra Magnesium Cream and learn how much your body needs by watching how quickly it absorbs. Australian based firm Elektra was founded in 2009 by Sandy Sanderson and her husband Peter. In the hunt for treatment for her own auto-immune disorder, Hashimoto's Hypothryoidism and severe heart arrhythmia, Sandy and her husband found the life-changing benefits of magnesium. Elektra Magnesium quickly found its way at the forefront of the transdermal magnesium revolution, and word of the Elektra Magnesium range quickly spread to the UK, where it has been used in wellness centres for a number years. Elektra Magnesium is also listed under the Australian Department of Health Therapeutic Goods Administration for its medicinal healing properties. StressNoMore is the only official UK stockist of Elektra Magnesium. Buy with confidence from StressNoMore, knowing you are getting the highest quality magnesium chloride products. The full Elektra range is made with natural and organic plant ingredients and natural, food grade magnesium chloride. Avoiding the toxic chemicals similar products use, which, over time, can result in skin irritation. The range is proudly free of parabens, petrochemicals and is Non-GMO. Full ingredient list: Purified water, 15% Elektra Magnesium chloride hexahydrate, Butyrospermum parkii (shea) butter, Cetearyl alcohol, Cacao (cocoa) seed butter, Prunus amygdalus dulcis (sweet almond) oil, Macadamia integrifolia seed oil, Prunus armeniaca (apricot) Kernel oil, Cocos nucifera (coconut) oil, Ceteareth-20, Cannabis sativa (hemp) seed oil, Lecithin, D-alpha-tocophrol (vitamin E) Glyceryl caprylate, Xanthan gum, Azadirachta indica (neem) oil, Sandalwood nut oil, Potassium sorbate, P-anisic acid, Alpha lipoic acid, Citrus aurantium amara leaf oil (petitgrain), canarium commune (elemi) oil, Michelia champaka flower (mag champa), Santalum spicata wood oil (sandalwood light fraction), Citric acid.